Someone called me the Compost Lady recently, and I realized I hadn’t written as ComposterMom in ages. A lot of my shorter posts end up on Facebook. I’m on the computer all day at work, so I don’t automatically pick it up when I come home. I need to be offline for a while every evening. Shopko is bankrupt and going out of business. Their clearance and liquidation sales are disappointing a lot of people. I haven’t even stopped in to check it out, to be honest. They’re at the point where the liquidation company, not the Shopko corporation itself, is running the show, and shoppers can tell. Discounts are weak, inventory isn’t very high quality, and there are more complaints than deals. We did get lucky with the smaller Shopko Express’ clearance. They transferred most of their inventory to other stores before the ax fell, but they couldn’t do that with their liquor stock. We picked up wine and specialty beers for pretty darn cheap. And that was all. Meanwhile, we reminisced about the irony that is our kitchen. We bought some very high quality pots and pans and other equipment dirt cheap from not one but three high end kitchen stores that were going out of business. One was in Green Bay, one in my little burgh, and one in Rochester, Minnesota (we were there for a barbershop chorus competition). Those were small shops, not corporate entities, and the owners were interacting with customers as they made deals. Oh, what a difference! Cast iron cleaning tools, towels, scrubbing cloths, and the best, a really nice wok. The Wire Whisk had used the wok for cooking classes, so we made an offer. The owner accepted the offer and reluctantly let it go. She talked about cooking classes, gave me good advice about seasoning it, and I think she shed a tear or two as I left with this wonderful piece of cookware in my arms. I hope she knew we’d treat it well – literally and figuratively speaking. Meanwhile, we are appreciating the newly remodeled kitchen and especially the storage space. The pantry cabinet has so much room it feels like a luxury. We have cupboard space for basic everyday goodies, and we have room to stock up when there’s a sale. I haven’t reached prepper stockpile level (yet), but it makes more room for my own canned goods, too. No longer do we have to trek down the basement for a new jar of jam or pickles. So on we go, my friends and family. It’s a crazy world out there, and I hear there’s a possibility of another late snowstorm next week. I hope the forecasters are wrong, but you know the saying – whether the weather, we’ll weather the weather. Chuck added me to his employer-sponsored health plan at the start of 2019. In order to add me to his employer-sponsored plan, we need to verify that we are, in fact, married. To prove that fact, we need more than a wedding ring or an album of pictures. We need the official, certified marriage certificate. Easy? Well, not exactly. Read on. We thought we had a copy in the house with our other important documents. We don’t. There may be a copy in our safe deposit box at the credit union, but we’re not venturing out in Snowstorm Destiny (local name) unless we have to brave the roads. We searched online and found the information for ordering a copy (or two) by mail. We gathered what we needed, and Chuck dropped it off in a mailbox on his way to work. You see, friends, we were not married in the same county in which we live. We were married in the state of Wisconsin, but not exactly where we now reside. We tied the knot in a county about 35 miles north of here. If ordering by mail doesn’t work or takes too long, one of us will need to take a day off from our job to make the road trip during business hours. It would be an inconvenience (read: Royal Pain), but we could do it. I keep thinking of those for whom this would be more difficult, even darn near impossible. We have the spare change to put gas in the minivan and head north to visit the register of deeds’ office in the county known as Packerland. We resent taking time from our jobs, but we have the option of using a paid day off for this errand. Not all working people have that option. Not all have reliable transportation, either, especially in a Wisconsin winter. This is a pain for us. It’s a bother. The situation is awkward and potentially a waste of a personal day for one or both of us. However, we can do it. We will do it. What about those who can’t? What if we’d gotten married in another state? What if we’d moved to a location farther away or, unlikely but not impossible, to Nova Scotia, where Chuck has extended family? How do people cope with a records request like this when they don’t have the options we have? That’s a long list of what-ifs. In our world, many people fit the what-if categories. And that’s just for health insurance. We won’t talk about voter I.D. At least I won’t bring it up today. Schools closed for two days. Utilities company asked customers to turn their heat down so there would be enough natural gas to go around. Utilities company threatened to levy fines on Chuck’s workplace for using too much natural gas in keeping the plant operating! 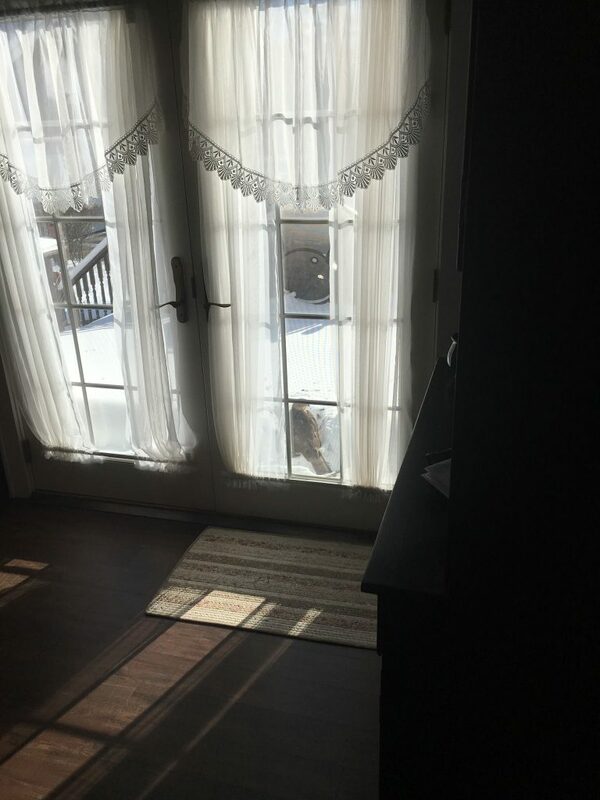 It was so cold that a hawk stopped in to keep warm over lunch. 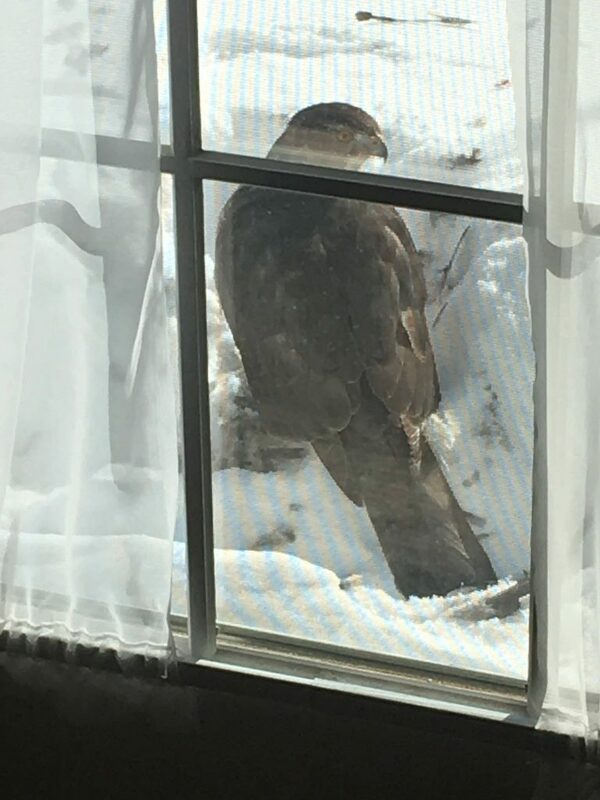 A hawk came to visit. Seriously. Yes, she was that close – and that big. We think she caught a sparrow for “lunch” and then found a somewhat sheltered spot to dine on it – next to the house, close to the door. The bird could have knocked on the door and asked to come in. Oh, yeah, people. It was that cold. It all started when I came home from the pharmacy on Wednesday with all of Chuck’s refills but without the Claritin that helps him prevent migraines. Thursday after school I went to Walgreen’s. I noticed several shelves full of Mucinex, our medication of choice when the flu-like viruses hit the O.K. Chorale. Yea, I thought, they have every variation imaginable. Chuck can pick out the best kind next time he’s here. Unfortunately, there were as many or more Claritin variations, some of which required identification and promises of spinning straw into gold before actually buying the drug. I looked them all over, and I panicked. I grabbed the store brand in a small box (in case I bought the wrong dosage or type) and rushed away to check out and save my sanity. My next stop was a local family restaurant to buy soup for supper. I pulled a quart out of the cooler, then thought, “I should get two.” But the cooler wouldn’t open again, so I gave in and checked out. Well, I waited to check out. There were three of us in line when someone finally came out to take our money. I used a gift card – used it up, in fact. I had to pull a few bucks in cash out of my wallet, too. Soup in hand, I went out to the van and put on my gloves. Er, glove. One was missing. I dug around the minivan, looked outside under it, and hoped like crazy that I hadn’t left it at the drugstore. When I went back into the restaurant, there were two workers at the cash register. What? At least my glove was there – on the floor next to the counter. As I left the parking lot, my hearing aid battery on the right went dead. Beep-beep-beep-beep! And of course, I can’t dig in my purse for a new battery and replace it. I drove home on one ear, so to speak. All this – at least I did one thing right. I got a drugstore rewards card for our family. Now we can actually get the bargain prices posted on the shelves when I bring Chuck back to pick out his favorite Mucinex and Claritin. It started with kitchen construction. It ended with a brain aneurysm treatment. It makes sense; I didn’t can very much last summer. I’m still a little bummed. With a major kitchen remodel in progress, I got up by 7:00 every morning even after school let out in June. I moved both vehicles out of the driveway so the carpenters could pull in. Then I would start my coffee, watch the morning news, and all the rest. I didn’t make jams or jellies because I didn’t have a stove in June and July. One result: rhubarb takes up much too much space in the freezer this year. I must find a way to use it up. Maybe in May. But anyway, no stove? No canning in early summer. Later on I went under – not under the knife, but under a catheter. Part I: cerebral angiogram to determine the size of the aneurysm. The nurse wore Crocs with the Swedish Chef on them. How awesome is that? But I digress. You can guess what followed – an overnight in the hospital after a three hour surgery to line the aneurysm so it will not get bigger. I had this done on a Thursday, and then headed off to school meetings the following Monday. And yes, I was tired. But back to canning. In between the two events, I managed to can a batch of sweet bread and butter pickles and a batch of kinda-meh dill pickles. I put up one batch of tomato sauce – only one batch, and it shows. We opened a jar of store-bought tomato sauce last night. I used commercially canned tomatoes last time I made chili. All the homemade ketchup, the last jar of enchilada sauce – it’s all gone. I’m a little sad looking at all the empty spots on the shelves that usually overflow with the goodies from the garden and the farmers’ market. Next June, I’m going to start canning like crazy. Canning like crazy and loving it, too! Dear Congresswoman Ocasio-Cortez; Hire a researcher. Consult this researcher before you make a public statement. No matter how sincere, if your announcement makes you seem uninformed, you will take unnecessary heat for it. -From one on your side, Daisy Democrat. Dear Governor-elect Evers; we’ve got your back. Do what you need to do. Sincerely, the state’s teachers. Dear Dr. Footwork; Thanks for the help. And thanks for the laser treatment. And please keep on pushing the insurance companies to cover laser treatment, too. Sincerely, Hopalong Daisy. Yes, My Friends, Santa Exists. A favorite memory from teaching 6th grade – more than ten years later, I still remember this class and this day. The entire school was bouncing. I expected the building itself to go boing, boing, boing any time, with the amount of pre-holiday energy inside it. One of our specialists commented, “Ms. M. has the ‘too-cool-for-school’ class this year, and you have the energetic one.” She was right. My class, full of really nice kids from wonderful parents, has turned into the elementary equivalent of Animal Planet. Since tranquilizer darts are frowned upon in public schools (I’m KIDDING, I’m kidding! ), I had to resort to creative drama to bring them to attention. My class, as a whole, had been quiet exactly twice the previous day. They were 6th graders, ages eleven and twelve. They were old enough to know the truth, but did they? I couldn’t take a chance on destroying someone’s innocence and having their parents hit the roof. So I gave them my stock answer: it depends on who you ask. Well, that didn’t last long. During my graduate program, I took a class in storytelling from a professional storyteller. I relied on those skills to get the students’ attention. When they asked me how many reindeer there were, I stopped, put on my hmmm, there’s a story in here somewhere pose, and waited for quiet. Amazingly, quiet descended almost immediately. And that was just math class. I found a copy of Yes, Virginia, there is a Santa Claus, told them the story, and read them the editorial. For those few moments, they were spellbound. That year my class left me exhausted and happy every single day. They wore me out with their energy, and they energized me with their enthusiasm. And every year around this time, I remember the way they listened and absorbed my answer to their question. Yes, young ones, there is a Santa Claus. He exists as certainly as love and generosity and devotion exist. The most real things in the world are those that neither children nor men can see. Wishing you a wonderful holiday with family and friends and your own generous spirit of Santa. I followed up with a few comments on the use – or not – of wrapping paper. I didn’t need to write a new post on the topic; a search for “wrapping” came up with several. Here is is, folks, a reprise of the No New Wrapping Paper philosophy. It’s time to remind myself (as if I needed the reminder) of my personal rule: No New Wrapping Papers. I give in on ribbons, invisible tape, and a few other basics. But as for wrapping paper, I dig in my heels. I am lenient on the re-use of gift bags – key word, re-use. I stuff the aforementioned bags with reused and reusable tissue. Sometimes we even decorate a plain bag with small scraps of re-purposed wrapping paper. Keep sending the old fashioned snail mail holiday cards! Besides enjoying them, we reuse many cards as gift tags. I cut circles out of cards to make decorative tops for canned goods (pickles and jams, especially). My family still gives me a hard time when I carefully unwrap big packages in order to re-use portions of the paper. That doesn’t stop me from doing it. I ran into a dilemma yesterday. What about buying wrapping paper at a thrift store? Well, that kind of purchase doesn’t waste as much money, and the purchase price often goes toward a good cause. However, gift wrap purchased elsewhere is still rarely recycled or recyclable, and still not suitable for fireplaces. It’ll still fill the garbage bin, too. I decided not to buy it. Readers, can you help me expand on the environmentally sound wrapping wisdom? Comment if you can. One Saturday night, not long ago, Chuck and I pushed a cart around the grocery store and filled it with all the necessary foodstuffs on our list. At least once, we encountered a very focused shopper noting totals in a notebook and sorting through piles – I kid you not, piles – of coupons. She was a Real Live Super Extreme Couponer. In our store! In our city! Wow! Where were the cameras? When we were ready to check out, there was only one checkout lane open, and she was in it. More power to her for taking the time and making the effort to shop this way, but we did NOT want to be in line behind her. I looked toward the self checkout, looked at my cart’s contents, and said nope, not going the selfie way. Luckily for us, the store staff provided another checker. Phew! As we left the store, we could hear Ms. Super Extreme Coupons with her checkout still in progress. Beep. Beep. Beep. Beep. Beep. Beep. Beep. Beep. Beep. Beep. Beep. Beep. Beep. Beep. The next day, we took the minivan to Kwik Trip to fill out the tank, and grabbed a few coupons on the way out the door. Chuck dashed into the mini mart to get the free bananas, dozen of eggs at half price, and a dirt cheap cup of gourmet hot cocoa. The cashier rang up his purchases, scanned his coupons, and then swept his Rewards Card. With the rewards card discount, his total came to a negative number. They owed him money. And at that, the cash register froze. He tried to pull it up into the positive numbers by buying a tube of Chapstick. The Chapstick wouldn’t scan. The cashier tried entering the code number manually. No luck. So Chuck tried again; he grabbed a candy bar. This treat scanned successfully – sort of. The total went farther into the negative, and this time read Transaction Finalized. Amid much laughter from the other customers, including one who had offered to help out when it appeared Chuck was short on cash, he headed quickly back to the van. “Don’t say a word! If the cops stop us, let me do the talking!” “What?! ?” He laughed and laughed as we zoomed home and tucked the minivan in the garage. Chuck the Super Coupon Man. Go figure. I never would have guessed. Yeah. As if I didn’t already know it, this text message exchange confirmed it. I am not one of the cool kids. Amigo: Stan Lee, founder of Marvel Comics, has died. La Petite: He was as legendary as his superheroes. Me: Sad. I guess he wasn’t Superman. La Petite: Mom, that’s DC Comics, silly.